It’s Wild About Books Wednesday! I hope you have been enjoying all of the Halloween books that I’ve been sharing this month. There are so many great books to use in October! If you’re new around here, I love literacy-based therapy! Books truly bring the speech room to life and provide endless opportunities to enhance language! Today is all about The Spooky Wheels on the Bus by J. Elizabeth Mills! 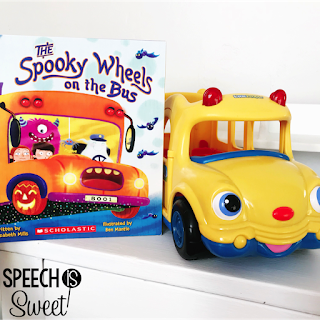 This book puts a spooky twist on the popular song, The Wheels on the Bus! This is a great book to use in therapy, because many students are familiar with the song! They’re already equipped with some background knowledge and that will set them up for success. 3. Quantitative Concepts – You can talk about quantity, example: There are more brooms on the bus than spiders or there are less cats on the bus than witches! Each item is numbered, for example four glowing wheels, five big spiders, etc so you can talk about the quantity of each item on the bus! Ask, how many witches? How many mummies? 4. What Questions – You can ask what each creature is doing! What are the mummies doing? What are the witches doing? What are the cats doing? This is great book to use to practice what questions! You could also ask tons of who questions too! Who is cackling? Who is singing? 5. Setting – I love this book for teaching the setting of the story! It’s a great way to demonstrate that setting is not only about the place, but also the time! This story is set on Halloween night on spooky bus! 6. Retelling – Bring the story to life! Add in a school bus toy (I adore the Little People School Bus) and other items that can help students retell the story (toy spiders, print out pictures of each character and cut them out). Set all of the items up around your speech room and students can drive the bus around the room to pick up the various creatures! 7. Temporal Concepts – Before/After are tricky concepts! This is a great book to use to practice those concepts. Example: Who got on the bus after the witches? What got on the bus before the spiders? 8. Verbs – Have students re-enact all the fun verbs in the story! The cats hiss, the witches cackle, the mummies sing, and the spiders spin! 9. Compare/Contrast – Compare this story with the original Wheels on the Bus! 10. Inferencing – The pictures in this book are wonderful and they lend themselves to working on inferencing! I’ll list some inferences that can be made in this book! In the scene where the bus is picking up the three cats at the bus stop, the cats are holding umbrellas! The song says “two white wipers go creak, creak, creak” but there is no mention of rain! This is a great opportunity for students to infer about the weather! It must be a rainy night! We don’t know it’s Halloween night until the very last page, but students can infer that it’s Halloween by looking at the very first page! The mummies are singing and they’re each holding mummy babies! The babies are either asleep or yawning. Let’s infer, what are the mummies signing? They must be singing lullabies to put their babies to sleep! Why are the witches cackling? If you look at the picture, they’re using their wands to do silly things. For instance, one witch makes a cat have spots! You can truly use the pictures in this book to work on so many skills! Don’t forget to subscribe to my newsletter is you’re interested in weekly updates and access to a free speech therapy resource library! Thank you for stopping by! I’ll be back next week with another fun book! I’m on a roll, so I’ll try to keep Wild About Books Wednesday going through November too! P.S. Check out The Speech is Sweet Club! I’ve planned out all of your therapy sessions and you’ll receive a brand new resource every week!